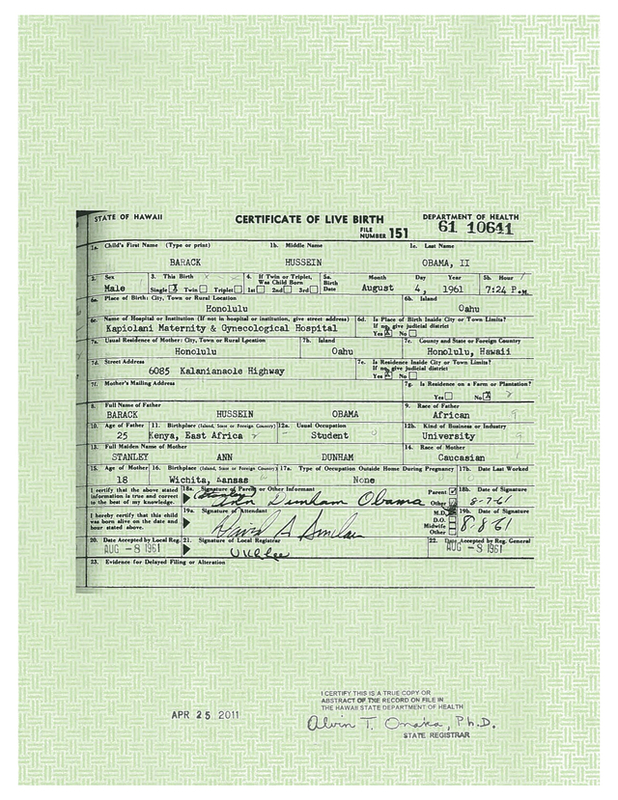 The birth certificate in question is actually a purported copy of Barack Obama’s original birth certificate which is currently held by Hawaii’s Department of Health. This copy was posted in April of 2011 on the official whitehouse.gov website where it still appears today. The following document is an exact copy of what appears on the website. Just in case the facts contained in the subtitle are not entirely clear, the allegations concerning the fraudulent and forged birth certificate have been re-stated by competent experts as follows. The first excerpt is from an article that was recently published on a major alternative news platform. What follows is a second excerpt from the same article quoting a second graphics expert which is equally as compelling. These extremely serious and substantive developments in the Cold Case Posse investigation will have extraordinary repercussions for the Obama Administration. The governmental, political and legal ramifications are so far-reaching that Watergate will pale in comparison. The relevant filed affidavits give every indication that this nation is about to enter an unprecedented constitutional crisis. Because there are two presidential terms involved, numerous executive orders issued and various treaties signed by this president, a nullified term(s) as president presents various legal and constitutional issues never confronted by the US Federal Government. Top investigators make serious allegations about what has been officially labeled a forged, fraudulent birth certificate. The entire Executive Branch will surely receive a tremendous amount of criticism for the part they played in this conspiracy to deceive the American people. Of course, the hundreds of individuals involved in the vetting process of this president will likewise take on their fair share of culpability in what has to be the “political crime of the millennium”. That would include a significant number of those in leadership throughout the Democratic Party to include both Bill and Hillary Clinton. It is quite difficult to see how the Democratic Party will emerge from their direct involvement with covering up such a serious forgery. Years of outright collusion in this highly convoluted and complex crime will certainly call into question the integrity of the entire DNC leadership. The many staff attorneys who participated in the vetting process and, therefore, in the coverup will also be subjected to intense legal and ethics scrutiny. Why has the leadership of both major political parties failed to proceed with the appropriate congressional investigations in light of so much compelling and irrefutable evidence of numerous crimes having been committed in the filing of the forged birth certificate? Especially criminal activity so serious and premeditated as filing a completely fake birth certificate which was used as proof of meeting the constitutional requirements of federal election law, as well as the additional statutory requirements of the fifty states. When faced with substantial allegations of a felony being committed, law enforcement authorities are obligated to see the investigation through to it end. They are required by law to determine the merits of the case and then make a criminal referral to the appropriate State Attorney. 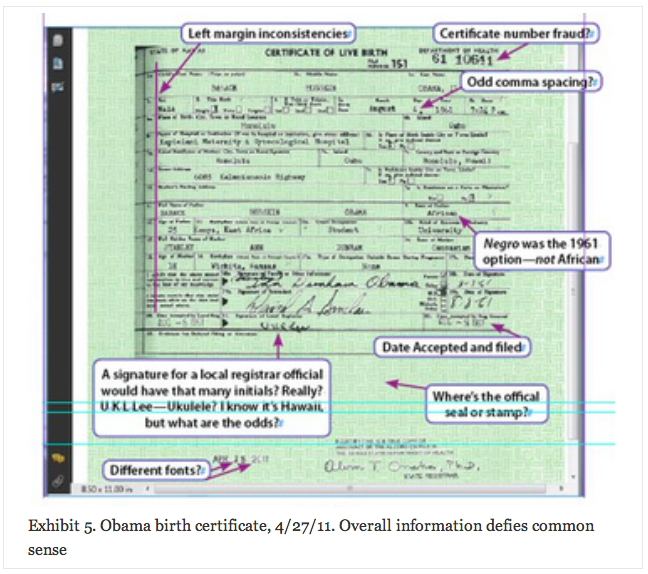 Apparently that process is exactly what is being played out throughout the nation regarding Obama’s forged birth certificate. 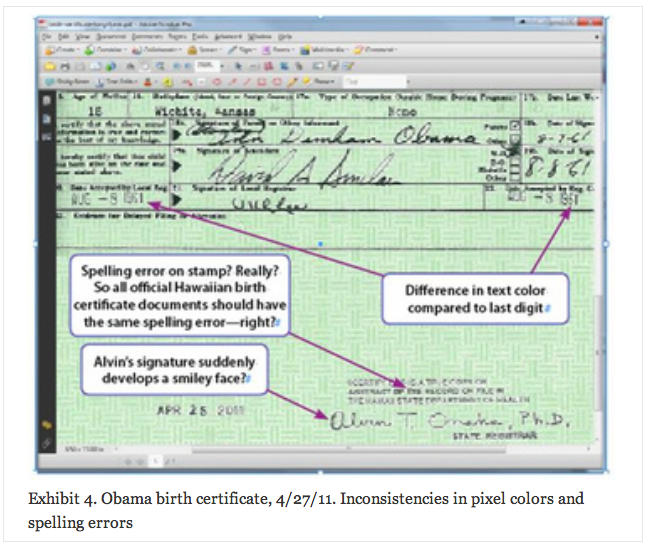 At least half of the State’s Attorneys across the country have been looking very closely at the Obama birth certificate forgery case for many years now. Each of them knows that their failure to pursue the legal merits, given the conclusive results of an official investigation, exposes them to charges of official misconduct. Misprision of felony is just one of the many offenses that each of the involved state officials can be charged with. It is inconceivable that the mainstream media (MSM) has not only avoided this story for over five years; it has gone to extremes to cover up the many “high crimes” involved. Likewise, never in US history has the entire political establishment been AWOL concerning a matter of such national significance and legal import. By neglecting to properly investigate these crimes, the nation is now faced with the prospect of a full blown constitutional crisis of epic proportions. YES … it is that serious and much more! “Totally unparalleled and unprecedented, with nary a whit of historical precedent” is the way that one commentator described the unfolding constitutional crisis.